Down On The Alameda Street, 1940s Style: Can You Identify These Mystery Cars? On my way to the neighborhood taqueria, I passed the Eternal Yard Sale House down the block- every 'hood has one, right?- for the thousandth time... and finally bought something: a 50-year-old photo album with some cool old car photos. The EYSH is a haunted-looking Victorian that hasn't seen fresh paint since Lyndon Johnson was president, and the endless yard sale represents the efforts of the owners to get rid of the stuff left behind by the long-deceased compulsive hoarder who once lived there. Mostly crap, but a couple bucks is a decent deal for a pair of photo albums (one entitled "A Child Becomes A Woman," documenting the life of a girl from her birth in the mid-1930s through graduation from Alameda High School, and the other a 1942 "Service Album" chronicling a soldier's experiences in various Army camps in New England). I'll probably drop off these photos at the Alameda Historical Society, but first: Ennui Countermeasure! 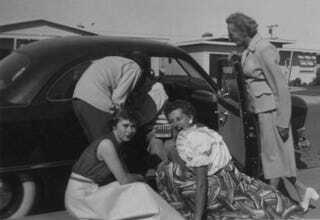 We've got five photographs, each with a car in the background. You must identify all five. A couple are slam-dunks, but the blurry 1930s sedan might prove a challenge. A copy of the Standard Catalog Of American Cars 1805-1942 will help here. OK, you want to prove your Detroit Iron expertise? Here's your chance! Here's proof that we're looking at some very early Alameda DOTS photos: using an address on a school ID card taped inside the photo album as a starting point, I was able to do a little Google Maps sleuthing to find the location of the scene in the previous photograph. Fast-forward 70 years and go about a block away and you'll find a '66 Mercedes-Benz 200D!